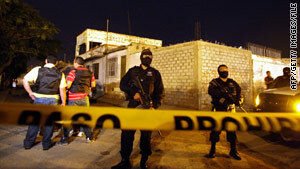 The Mexican border city of Ciudad Juarez already has surpassed 2,000 homicides this year, figures show. (CNN) -- Has Ciudad Juarez, Mexico, been lost to the drug cartels? New figures released to CNN on Wednesday by Mayor Jose Reyes Ferriz indicate the death toll for this year already has surpassed 2,000 homicides, almost 400 more than the total count for 2008. "It has been 22 months of this war, and it hasn't stopped. The violence has increased, and the possibility that it will stop is becoming more remote," Reyes Ferriz said in a phone interview. The mayor attributed the surge in drug-related violence to an influx of cartel groups. The rival Sinaloa and Juarez cartels are making their way to the city to participate in the warfare for the control of the smuggling route between Ciudad Juarez and El Paso, Texas. The Sinaloa cartel is headed by Mexico's most wanted man, Joaquin "El Chapo" Guzman, according to authorities. "The majority of the people detained and the bodies found are not from Ciudad Juarez. It is an intense battle between these two groups. The level of violence has reached new levels. Retaliation between the groups has become more violent and terrorizing," Reyes Ferriz said. Dismemberments and beheadings have become a common method of retaliation. A government source close to the investigation told CNN about a case where a relative of a drug cartel member was tied to two trucks and stretched until his arms where ripped apart. "The important thing for the population is that the large majority of these cases are criminals. We haven't had many cases in which the general population has been involved," Reyes Ferriz said. According to Ciudad Juarez government figures, about 100 homicides in 2009 have been "inocentes," or innocent bystanders, compared with around 30 in 2008. These homicides include people caught in crossfire and relatives of cartel members. Asked whether he sees a light at the end of the tunnel, the mayor said he is awaiting the arrival of 1,000 police cadets who recently graduated. "The light has just arrived," he said. "We are beginning the second phase of our work. It took us year and a half to strengthen our police force. We are optimistic the surge in the police force will put us in a different place." Reyes Ferriz said that in the past six weeks 22 people have been detained in 800 homicides and now await prosecution.